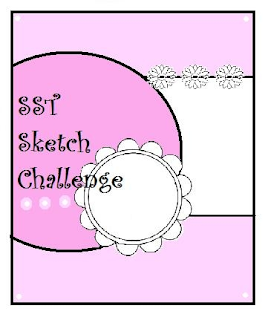 LadyLuvBug: SST Sketch Challenge for February! Hello everyone, well today Sweet Stamping Treats is hosting a sketch challenge and your are all invited to play along.We have a fabulous new sketch for you, and we want to see you create! 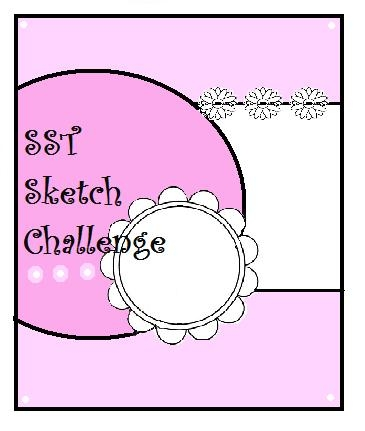 Use this sketch and an SST stamp to make a project and add it to the linky on the SST Blog for your chance to win 3 SST stamps! The papers are all from my stash except for the large circle Which I printed from a file I purchased from Scrap Girls I used a Tim Holtz embossing folder from the Spring Time and Borders Set for the large mat added some yellow ribbon a little stitching and it was done I'm thinking it is missing something maybe a little lace around the larger circle. What do you think? Head on over to SST's to see what the rest of the DT created and get the details on how you can enter the challenge. Thanks for stopping by and hope to hear from you. great card! I just love anything purple. I really like the embossing, very nicely done . tfs! What a great job!! I love it. I love the embossing and the silver liquid pearls, they really stand out. I hope all is well my friend! !